Posted on September 28, 2014	by Rev. Joe Jagodensky, SDS. “In status, rights and opportunities” is the definition of equality. Equality is a goal we all want but never seem to achieve. (Why would we have a goal that we say we want but don’t try to realize?) In the U.S. whites don’t know what to do with blacks and religiously whites don’t care for the Jews but we totally support their country. (“It’s a nice place to tour when it’s quiet.”) Blacks look down on Hispanics and Hispanics look down on other Hispanics. We can’t even talk about politics. Our beloved church is no different, especially these days, when the priesthood is retaking an ascending role that separates me from, well, for lack of a better word, you. And we continue to talk about equality and yet do nothing to make it happen, a reality. Religious Brothers are asked their whole lives “Why they did not go all the way?” and Religious Sisters are being investigated by the Vatican for misguided beliefs. I have my elevated role (only two steps to get to this sanctuary – there ought to be more!) yet I’m still not a real priest, a Jesuit. Alas, the rungs of my life that have been missed. But wait! It’ll be different in that place we all pray for every day here. It’ll be different up there, in the clouds when all this earthly inequality will be erased and unity finally consummated. We just have to wait until the Kingdom is open to us for then we will unfortunately hear the heavenly rules of inequality which include non-inclusive groups of angels, the greatest of whom we honor each September 29 – Michael, Raphael and Gabriel. If you thought “Games of Throne” or “Lord of the Rings” was difficult to follow, just trying following what the Catholic Church conjured up for you. These are the highest order or choir of angels. They are the angels who are attendants or guardians before God’s throne. They praise God, calling, “Holy Holy Holy… Seraphim have six wings, two cover their faces, two cover their feet, and two are for flying. Cherubim rank after the seraphim and are the second highest in the nine hierarchies or choirs of angels. They are manlike in appearance and double-winged and were guardians of God’s glory. They symbolized then, God’s power and mobility. Thrones are the Angels of pure Humility, Peace and Submission. They reside in the area of the cosmos where material form begins to take shape. The lower Choir of Angels need the Thrones to access God. Virtues are known as the Spirits of Motion and control the elements. They are sometimes referred to as “the shining ones.” They govern all nature. They have control over seasons, stars, moon; even the sun is subject to their command. They are also in charge of miracles and provide courage, grace, and valor. Powers are Warrior Angels against evil defending the cosmos and humans. They are known as potentates. They fight against evil spirits who attempt to wreak chaos through human beings. Archangels are generally taken to mean “chief or leading angel,” they are the most frequently mentioned throughout the Bible. 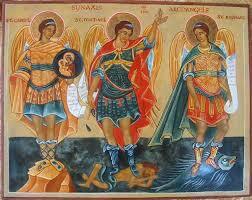 The Archangels have a unique role as God’s messenger to the people at critical times in history and salvation. And, I’m still up here and you’re still, well, somewhere over there and over there.